Tiara and Tom’s wedding at Wild Basin Lodge in Allenspark, Colorado was such a dream!! Fall weddings in Colorado are some of my favorite because the weather is gorgeous and the colorful Aspens are to die for!! 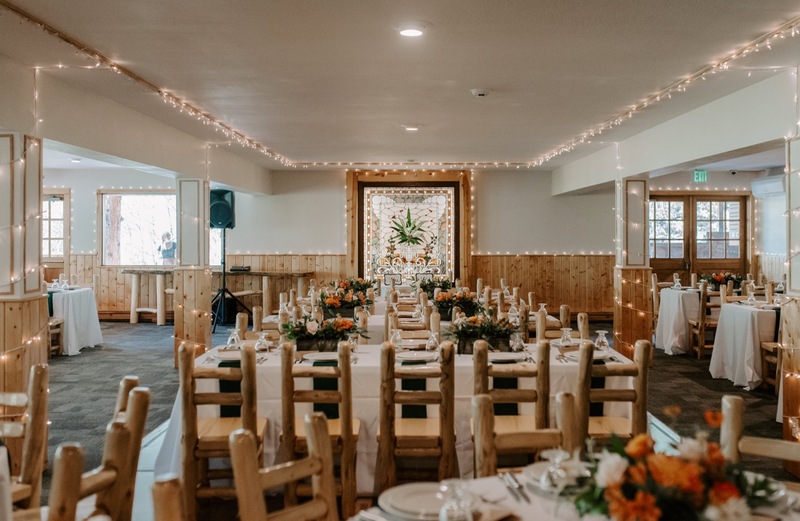 Wild Basin Lodge is one of my favorite venues in Colorado because it’s a perfect mix of gorgeous scenery, a rustic mountain feel, and so cozy and romantic. Tiara and Tom’s wedding was so beautiful, laid back, and fun… and just so them (their pup was even their ring bearer…ummm more dogs in weddings please?!). Getting to know these two over the last year has been so so special. From hiking in the foggiest weather I’ve ever seen at 6am for their engagement session while my husband slept in the car with their puppy (LOL), to going to Dashboard Confessional concerts together, they have grown to be not only super amazing clients but great friends too!! Seriously how am I so lucky to be blessed with the greatest clients on earth?!! You can also check out their super cute engagement session that was featured on Rocky Mountain Bride here!